The MS6-SV and MS9-SV pharmaceutical pneumatic safety valves feature compact size, soft start functionality, and an advantageous price versus performance ratio. The MS6-SV and MS9-SV pharmaceutical pneumatic safety valves feature compact size, soft start functionality, and an advantageous price versus performance ratio. The MS6-SV is available in Performance Level c and eunits; the MS9-SV is available in a Performance Level c unit. Both the MS6-SV and MS9-SV have integrated soft start and exhaust functions in a compact unified body. 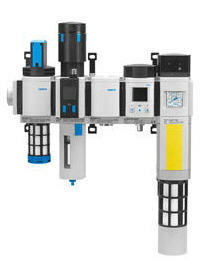 OEMs and end users have the flexibility of mounting these safety valves as stand-alone units or as a component of the modular Festo MS air preparation system. The MS6-SV-E series is certified to the DIN ISO 13849-1 safety standard – category 4, performance level e. This valve has an extremely high exhaust rate for its size – 9,000 l/min from P2 to P3. The valve delivers continuous testing and sensing of the safety function. The MS6-SV-E-ASIS valve option has an integrated network connection to AS-Interface Safety at Work, which eliminates the need for an additional safety relay. The ASIS valve option includes switching status sensing and diagnostic functions. The input and output pressures P1 and P2 are internally monitored and can be read via the AS-Interface bus.